My favourite sweet is mawa gujiya from Pulla Reddy Sweets in Andhra Pradesh which is a speciality Nothing can beat the taste of this gujiya. I am so happy that my gujiyas were quite similar in taste. Milk ................ 1/4 cup or as needed to knead the dough. Desi ghee or oil ... for frying the gujiyas. 1.Take the flour in a large bowl and mix a pinch of salt, 2 tsps icing sugar, 2 tbsps desi ghee. 2. Knead it with milk to make a soft dough. Cover and set aside at least for an hour. 3. Take small portion of dough and roll it into a round shape. 4. Spoon a little mawa as required and fold it into a semi circle. 5. Press the sides well to seal. Using your finger tips start pinching and folding the edge to make a design. 6. Heat ghee or oil and fry the gujiyas on medium flame to a light golden colour and they should be nice and crunchy. 7. While you fry the gujiyas make a thick sugar syrup with one cup sugar and half cup water. Flavour the syrup with cardamom powder.You can also add rose petals if you have them. 8. When the sugar syrup is boiled to one string consistency, tip in the fried gujiyas. Let them soak for few minutes until well coated. 9. Remove them on a serving platter and garnish with silver varq and rose petals. 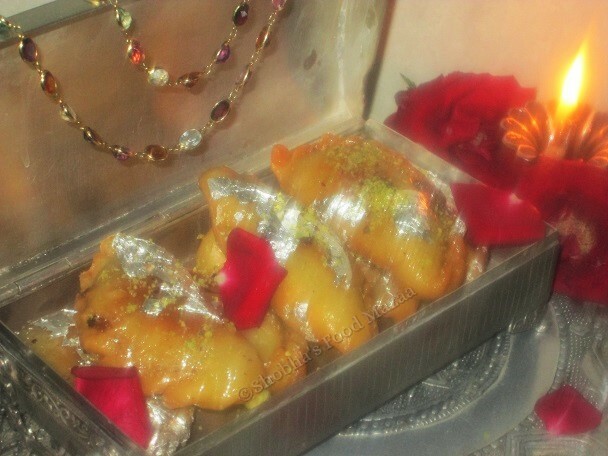 A lovely & delicious dessert for diwali............must try. So beautifully made and presented. Happy Diwali, Shobha!! Shobha, I've tried mawa gujiya but without the syrup. This is a new recipe for me where gujiyas are soaked in syrup. Looks really tempting.